It is time for yet another project with my Amiga 1200 at home and this time the goal will be to lower the current temperature on my Blizzard PPC as much as possible. After Stachu had upgraded my card with a 060/66MHz and 603e/330MHz did not only the speed increase but also the temperature. As many of you know, heat is one of the major reasons for killing electronics, especially old components. I’m no über geek at cooling but I hope that this project will highlight this subject alot for me. The standard cooling of the Amiga 1200 works as the picture below. Due to the dynamic of the nature, hot air raises while cool air is drawn into the computer. The cool air is sucked in via the small ventialtion holes in the lower part of the housing, cooling the electronic parts and going out through the ventilation above the keyboard. A standard Phase5 Blizzard PPC card have a cooling fan with the dimension of 30x30x7mm that pushes the air through a hole on the that is on top side when it is assembled in the Amiga 1200. On the other side of the card is a heatsink that is placed on the 603e PPC CPU, meaning that both the MC68060 and the 603e PPC are facing downwards. With the trapdoor closed, no heated air can get out in a effective way. That results in that heated air will be re-used for cooling that that is never good. Because of that I have done a smaller modification of the trapdoor, it helped some but far from being acceptable by me. This makes me wonder how and what Phase5 through when they designed this, othereise awesome card. Reverse the cooling on the BPPC-card so cold air will be pushed through and upwards instead of the oppsite. The challange here is that the lower ventilation holes are less in area than the upper ones. This will probably cause an underpreassure, which I don’t know if it is good or bad. 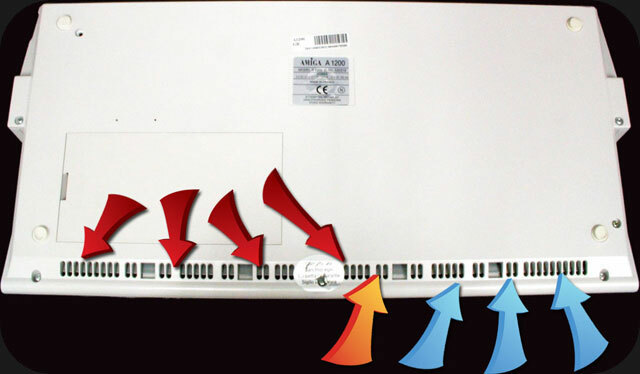 Divide the inside of the computer and create separate channels for the air to travel through from the upper ventilation holes using styrofoam. The downside of this solution is that heatet air can re-enter the housing. Watercooling FTW… I’t tempted to build a watercooled solution but as it is now I neither have the time or resources to pull such thing through (even if I know that many of the reader of this blog would want that).